The Couple in the Cage: Guatianaui Odyssey (1993), based on the performance series created by Coco Fusco and Guillermo Gómez-Peña. Film directed and produced by Coco Fusco and Paula Heredia. Courtesy Video Data Bank | School of the Arts Institute Chicago. Coco Fusco (born 1960 in New York City, US) is a Cuban-American interdisciplinary artist and writer. Her works combines electronic media and performance in several formats and focuses on the relationship between women and society, race and politics. She currently serves as the Andrew Banks Endowed Chair at the College of the Arts at University of Florida. Guillermo Gómez-Peña (born 1955 in Mexico City) is a Chicano performance artist, writer, activist and educator. His seminal performance art pieces are concerned with the radical exploration of borders –physical, cultural or otherwise–, hybrid identities, and the politics of language. Paula Heredia (born 1957 in San Salvador, El Salvador), a filmmaker and film editor based in New York City. She is the co-founder of Heredia Pictures, LLC, which keeps close ties with El Salvador through programs promoting education, culture and international exchange. The VENICE INTERNATIONAL PERFORMANCE ART WEEK 2016 presents The Couple in the Cage: Guatianaui Odyssey (1993), based on the performance series created by Coco Fusco and Guillermo Gómez-Peña. Film directed and produced by Coco Fusco and Paula Heredia. 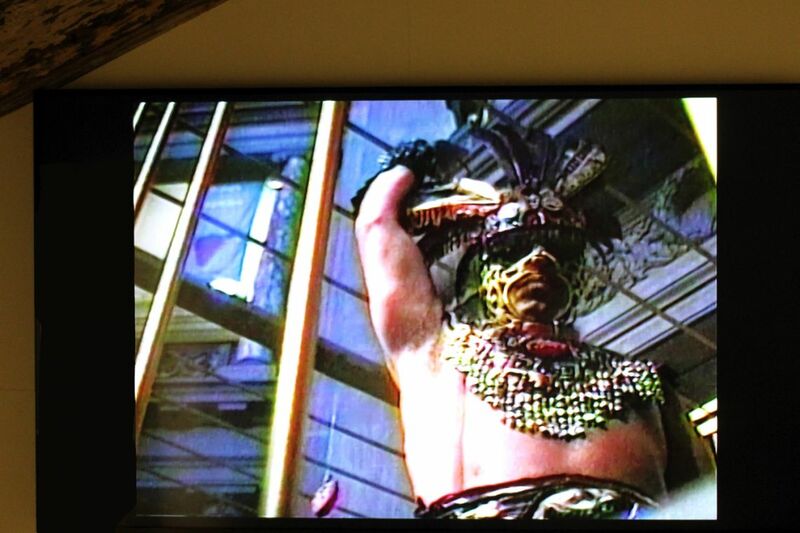 In a series of performances named The Year of the White Bear and Two Undiscovered Amerindians Visit the West (1992–1994), Fusco and Gomez-Pena decked themselves out in primitive costumes and appeared before the public as "undiscovered AmerIndians" locked in a golden cage — an exercise in faux anthropology based on racist images of natives. Presented eight times in four different countries, these simple performances evoked various responses, the most startling being the huge numbers of people who didn’t find the idea of "natives" locked in a cage objectionable. This provocative video suggests that the "primitive" is nothing more than a construction of the West and uses comic fiction to address historical truths and tragedies.